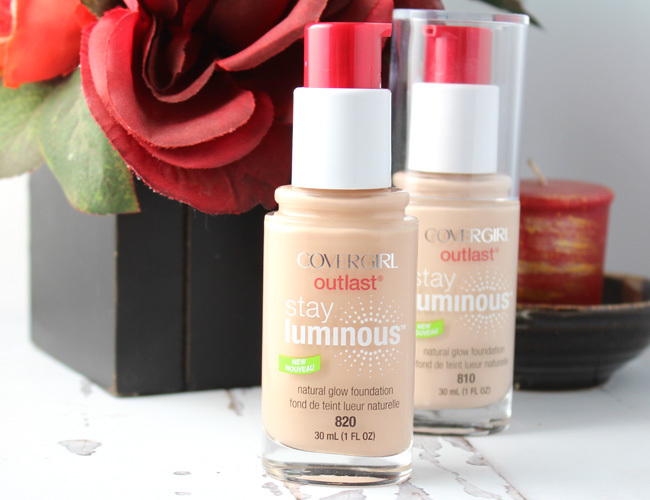 COVERGIRL Outlast Stay Luminous Foundation. 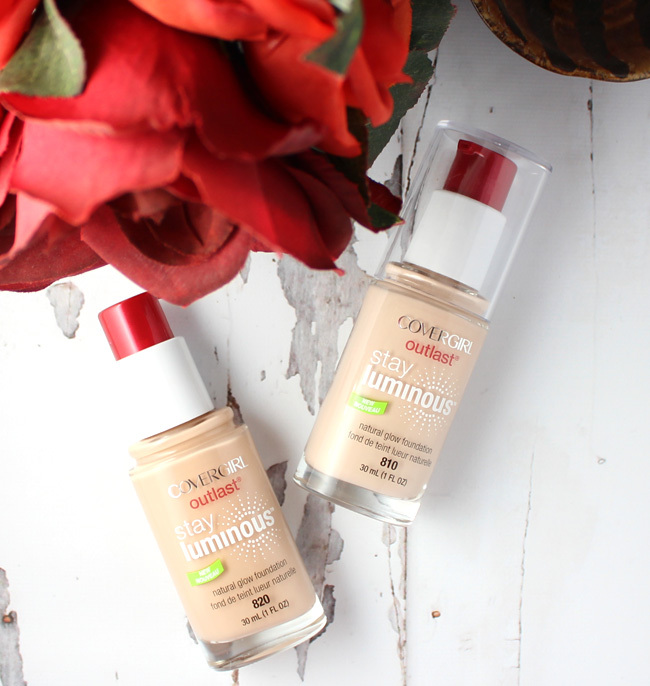 One of my very favorite drugstore foundations is COVERGIRL Outlast Stay Fabulous 3-in-1 Foundation. I have been longing for a more luminous version to rival my holy grail Armani Luminous Silk Foundation that I wear almost everyday and it is finally here: COVERGIRL Outlast Stay Luminous Foundation. I was so excited to give it a try and put it to the test. It is a dupe? "Outlast Stay Luminous Foundation’s oil-free, non-greasy formula gives your skin a natural luminosity that lasts all day! Perfect for achieving radiant skin, this all day foundation hydrates skin while providing flawless coverage." I've been wearing Outlast Stay Luminous for a little over a week now and have applied it with various methods (more below) and I need to say that I am very impressed with this new foundation. Outlast Stay Luminous provides excellent, long lasting coverage that leaves a dewy finish and a subtle glow. The finish is absolutely beautiful. There is no noticeable shimmer or sparkle (thank goodness) and the formula never settles into wrinkles, fines lines, cakes or creases. I have worn it both alone and over primer (can't wait to try the new Outlast All Day Makeup Primer that was made to go with it) and either way I get all day wear out of this one. It does look more fresh and flawless with a primer and I normally wear primer so that is how I would wear it anyway. As far as applying COVERGIRL Outlast Stay Luminous, I found that I like applying it with a damp beautyblender sponge the best. I really like to control coverage where I need it more and this way I can dab on areas where I need more coverage. If you don't need as much control in where you need coverage, I would suggest using a brush such as Dior Backstage Foundation Full Coverage Fluid Brush or Sigma F80 Foundation Brush. So is COVERGIRL Outlast Stay Luminous Foundation a dupe for Giorgio Armani Luminous Silk Foundation? I would say it is the closest drugstore foundation that I have found to it yet! They just really need to expand the shade range because right now Outlast Stay Luminous only comes in seven shades from Classic Ivory to Soft Sable. I tested this using 820 which is Creamy Natural and I am desperate to find this in Buff Beige which I think will be Armani 5.5 match, though I have yet to find this foundation in any of my local stores. COVERGIRL Outlast Stay Luminous Foundation has a suggested retail price of $11.30 and should be available at your favorite drugstore or mass retailer any day. Let me know your thoughts on this foundation in the comments.